As the tightly-packed crowd squeezes together like sardines, a symphony of shutters accompanies the lyrical oohs and aahs. Meanwhile, thousands of pedestrians stand in the middle of the street below; completely stopping traffic for at least five minutes. Such is Manhattanhenge; a biannual solar event where the sunset perfectly aligns with New York City’s street grid. Manhattanhenge’s moment of glory: shining across the Chrysler Building and down 42nd Street. In 1811, New York City ushered in a new era of urban planning and growth. Instead of haphazardly placing streets in any direction, all new construction would take place along an east-west facing grid. Not only did finding an address become easier, it also ensured two majestic and grid-aligned sunsets each year. Manhattanhenge on the Upper East Side: as seen from Roosevelt Island. Wait. Shouldn’t the sun only align ONCE a year? “Unnoticed by many, the sunset point actually creeps day to day along the horizon: northward until the first day of summer, then returning southward until the first day of winter. In spite of what pop-culture tells you, the Sun rises due east and sets due west only twice per year. On the equinoxes: the first day of spring and of autumn. Every other day, the Sun rises and sets elsewhere on the horizon. An Instagram photo from Times Square. Simple answer: two are at sunrise and two are at sunset. 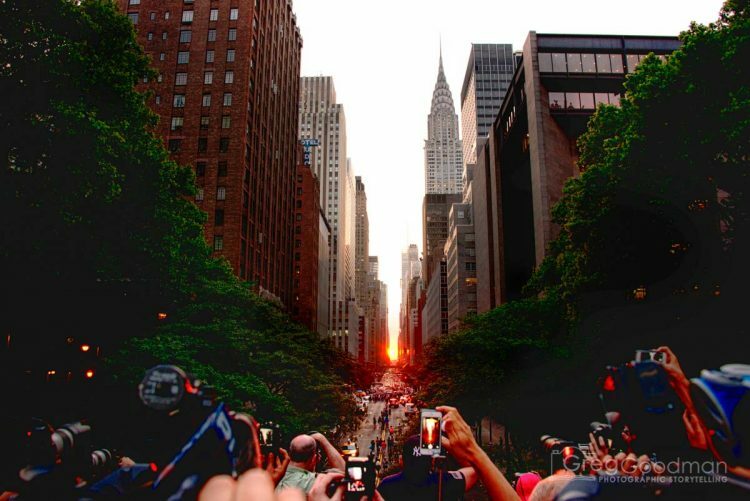 When astrophysicist Neil deGrasse Tyson coined the phrase Manhattanhenge in 2001, he was referring to both. However, the sunrise events take place in December and January; when it’s really cold in New York City. This means less crowds; but, it also means shivering your tuchas off waiting for the sunrise. For that reason, Manhattanhenge’s summertime sunsets have become the talk of the town: usually happening between Memorial Day and Baseball’s All Star Game. You can watch Manhattanhenge from anywhere in New York City: beginning on 14th Street. The wider blocks – such as 14th, 23rd 34th, 42nd and 57th – offer a few extra seconds of sunset bliss: as well as iconic buildings to frame your photo. That said, if you face West on any street in NYC, you will have a spectacular view. For a higher vantage point, seek out one of the city’s overpasses. This keeps cars and people out of your shot and allows you to really zoom in on the action. Street-level views can be powerful as well. Many people choose to dodge traffic and run into the street to snap their photo. Just be careful! Once you hit Central Park, you will need to be on the West Side to see the view. Set your aperture to a higher value to get a starburst in your photograph. Be sure to experiment with both zoom and wide angle photos. Check out Tom Grill’s site or Accuweather for more tips. To completely avoid crowds, snap your photos the day before or after Manhattanhenge; when the sun is only half visible but the photos are just as stunning. Photographing Manhattanhenge means jockeying for a prime spot with hundreds of other photogs. However, if you show up a day early, you can have the place all to yourself. — Big thanks to Sean Fitzthume for this photo. Check out Sean’s portfolio or follow him on Instagram. Where is the BEST place to photograph Manhattanhenge? Arguably, the best place in New York City to watch Manhattanhenge is an overpass above 42nd Street and 1st Avenue. From that elevated position, you have a wide assortment of photo framing options and a perfect view of the Chrysler Building. As you can imagine, such a perfect photo spot fills up fast; with intrepid shutterbugs arriving as early as noon to stake out the prime positions. Good luck trying to drive through the City during Manhattanhenge. I met my friend, Jill, at 7:00pm. The overpass already was filled with people clamoring for a spot. Our next 80 minutes were spent guarding the few inches of empty space surrounding us. It was a losing effort. Thanks to Jill, for capturing me in action. By the time the sun began illuminating 42nd Street, I was balancing on the edge of a sidewalk; sandwiched between a parked car and a man holding a tall tripod. Surrounding me were at least 400 people; all trying their best to find a clear view of the sunset. Manhattanhenge only lasts a couple of minutes; so everyone had to act fast. Hundreds of iPhones were thrust in the air; alongside professional dSLRs, HD news cameras, GoPros and more. All around, people yelled at each other to move; while complaining about cameras and hands blocking their shot. Lots of people had tripods. A few ingenious photographers brought stepladders. One car even stopped in the middle of the street so its driver could stand on the trunk and snap a pic. Then, just as quickly as it began, Manhattanhenge was over. After the sun sets, don’t forget to turn around and look East.